NAMED ONE OF THE BEST BOOKS OF THE YEAR BY People ∙ O: The Oprah Magazine ∙ Financial Times ∙ Kansas City Star ∙ BookPage ∙ Kirkus Reviews ∙ Publishers Weekly ∙ Booklist With a voice as distinctive and original as that of The Lovely Bones, and for the fans of the speculative fiction of Margaret Atwood, Karen Thompson Walker’s The Age of Miracles is a luminous and unforgettable debut novel about coming of age set against the backdrop of an utterly altered world. NEW YORK TIMES BESTSELLER “Maybe everything that happened to me and to my family had nothing at all to do with the slowing. It's possible, I guess. But I doubt it. I doubt it very much.” Spellbinding, haunting, The Age of Miracles is a beautiful novel of catastrophe and survival, growth and change, the story of Julia and her family as they struggle to live in an extraordinary time. On an ordinary Saturday, Julia awakes to discover that something has happened to the rotation of the earth. The days and nights are growing longer and longer, gravity is affected, the birds, the tides, human behavior and cosmic rhythms are thrown into disarray. In a world of danger and loss, Julia faces surprising developments in herself, and her personal world—divisions widening between her parents, strange behavior by Hannah and other friends, the vulnerability of first love, a sense of isolation, and a rebellious new strength. With crystalline prose and the indelible magic of a born storyteller, Karen Thompson Walker gives us a breathtaking story of people finding ways to go on, in an ever-evolving world. 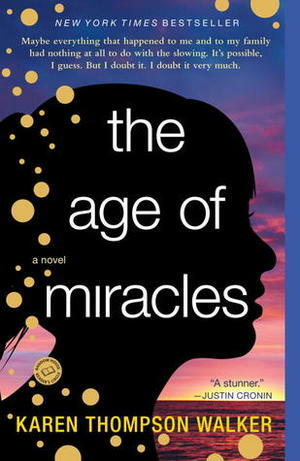 Praise for The Age of Miracles “A stunner.”—Justin Cronin “A genuinely moving tale that mixes the real and surreal, the ordinary and the extraordinary, with impressive fluency and flair.”—Michiko Kakutani, The New York Times “Gripping drama . . . flawlessly written; it could be the most assured debut by an American writer since Jennifer Egan’s Emerald City.”—The Denver Post “If you begin this book, you’ll be loath to set it down until you’ve reached its end.”—San Francisco Chronicle “Provides solace with its wisdom, compassion, and elegance.”—Curtis Sittenfeld Don’t miss the exclusive conversation between Karen Thompson Walker and Karen Russell at the back of the book.